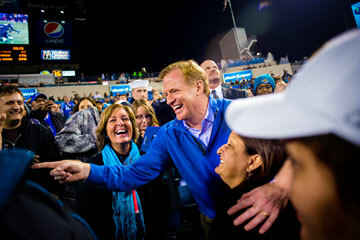 Can Roger Goodell Save Football? As commissioner, Goodell reverted to high-school-enforcer mode. He introduced a new player-conduct code in 2007 and wasn't shy about punishing those giving his league a bad name. Goodell benched Adam "Pacman" Jones, for example, for all of the 2007 season and part of the 2008 season after multiple arrests. He sat the Steelers' star quarterback Ben Roethlisberger for six games in 2010 over behavior tied to an alleged sexual assault in a bar--even though no charges were filed. While Goodell attacked player misconduct from the outset, he was slower to respond to the growing evidence that concussions were more than a minor occupational hazard. In October 2009, Congress dressed him down for it. California Democratic Congresswoman Linda Snchez compared the NFL's soft-pedaling concussion risks to tobacco companies' denying that smoking could damage your health. The NFL's oddly named Committee on Mild Traumatic Brain Injury (MTBI), led by a rheumatologist, produced research on concussions that was widely panned. Dr. Mitchel Berger, who sits on the since renamed Head, Neck and Spine Medical Committee, told the New York Times that there was "no science" in one of the group's studies. Critics fault Goodell for not shuttering the MTBI committee sooner. "You have to realize when you're not getting the right advice," says Eleanor Perfetto, whose husband Ralph Wenzel was an offensive lineman for the Steelers and San Diego Chargers in the late 1960s and early '70s, and died from complications from dementia at age 69 in June. Perfetto, who has a Ph.D. in public health, is a plaintiff in the concussion class action against the NFL. "That's part of leadership," she says. Goodell concedes that "you can always look back and say it could have been done faster." But he argues that the NFL's reaction to concussions has been "very responsible." He points out that if the league had put into effect stricter return-to-play rules earlier, players might not have reported their symptoms since the dangers of concussions are clearer now than they used to be. While Goodell won't take sides on the medical debate about concussions, he now acknowledges that football may do damage. "It doesn't take a lot to jump to the conclusion that constant banging in the head is not going to be in your best interest," he says. Rule changes reflect that reality. The collective-bargaining agreement signed after the 2011 lockout reduces the number of off-season practice sessions and limits the number of full-contact practices in the regular season, cutting exposure to potential injury. The return-to-play guidelines are tougher: once a player is diagnosed with a concussion, he's out for the rest of the game. Kickoffs were moved up five yards, to the 35-yard line, which leads to more touchbacks and fewer collisions. The NFL says concussions on kickoffs were down more than 40% last season. Some of the NFL's most fearsome players, including Baltimore legend Ray Lewis, have been fined for vicious hits as Goodell tries to deter dangerous play. "The reality is, since 2010, no professional league or amateur association has made more of a change to help player safety than the NFL," says one of the league's former critics, concussion expert Robert Cantu, who co-directs Boston University's Center for the Study of Traumatic Encephalopathy.